The difference between buying micromanipulators and buying an integrated solution is often the difference between having a tailored solution and no solution at all. Every system is bespoke for each customer’s application - and Klocke is reknowned for breaking new application ground. 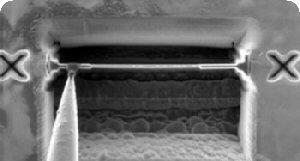 Whether you want to sort aerosol particles in a SEM, machine parts on the nanoscale or microscale to a given pattern, have a nanorobotic assembly line as we have made for a major multinational, make elecrical probe measurements on the nanoscale, want to do something that has never been done before or merely TEM lamella lift-out, Klocke provides preceisely tailored solutions. sales@acutance.co.uk or on +44 (0)1892 300 400.